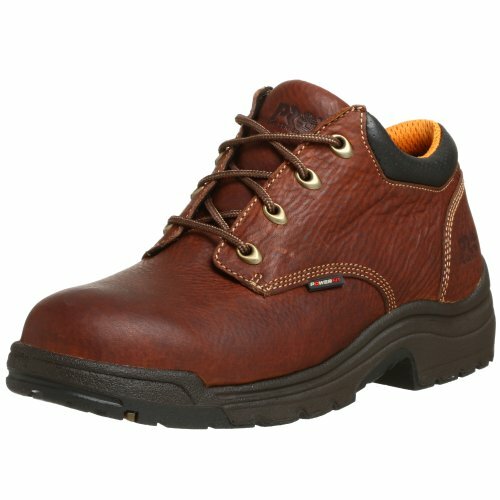 How to Choose The Best Shoes for Standing on Concrete? How to Eliminate Back Pain? Feet can take a beating, especially if you’re continuously pounding the pavement for long periods of time. Concrete is an inflexible surface and is extremely hard on your feet, which can make them swollen and sore and affect other parts of your body, such as your knees and back. It’s important to realize that wearing inappropriate shoes or boots while walking on cement can lead to irreversible damage to your body, causing years of pain. For these reasons, you need to find the best shoes for standing on concrete and you’ll find a lot of information on this page to help you. We thoroughly research the pros and cons of each option and only show the brands that are worthy of recommendations. We are not here to promote or sell any particular brand, which means that you’re getting completely honest reviews. Feet are important and it’s imperative that they are taken care of properly. By protecting them with the right footwear, you will perform and feel better. RESISTANT : Abrasion and Slip resistant. Non-marking. Oil resistant. Chippewa is another top brand that features boots that are comfortable working on or with concrete. These Apache plain toe boots feature an easy pull-on lace-up system with hardware accents for convenience, plus they are easily adjusted for adequate support. A removable cushioned insert and Drill Vamp lining provide long-lasting comfort, along with the lightweight Vibram gumlite synthetic outsole for a confident grip on surfaces. Furthermore, these particular boots are featured in a smooth chocolate leather top and a 6” leather shaft. They are round-toed ankle-high boots and are very lightweight at only 1.9 lbs. 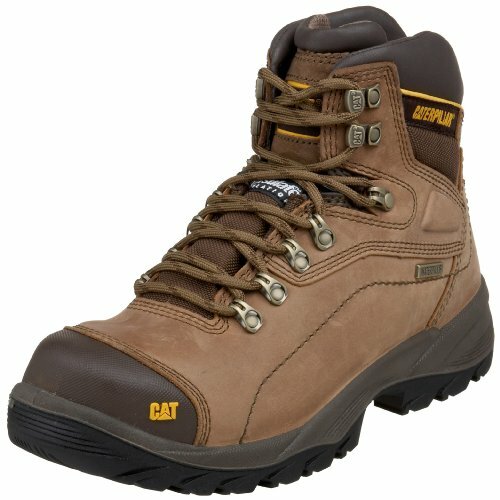 The Apache Lace-Up Boots would be ideal for anyone in the road or cement construction fields as they are built durable and provide ample cushioning for your feet to eliminate stress to your knees and back caused by long hours subjected to hard surfaces. Click to read more Chippewa boots reviews. Boots should be comfortable no matter what line of work you’re in; however, some boots offer that additional comfort you require when subjected to cement surfaces. Wolverine Work Boots are one of those brands that integrate extra comfort with a removable cushioned footbed, a removable cushioned insert and a lightweight nylon shank that prevents fatigue. In addition, a steel toe incorporated with these boots for extra protection. A moisture managing mesh lining wicks away moisture so your feet remain dry for hours of continuous wear. The outsole is constructed with a Wolverine cemented sole that provides flexibility. Equally important, the shaft of these boots measure 5” inches from the arch and provide adequate support to the ankles. Not only will these boots handle the torment produced by hard surfaces, they are also designed for those who work in several different fields of work because of the steel toe protection that is required at some jobs. 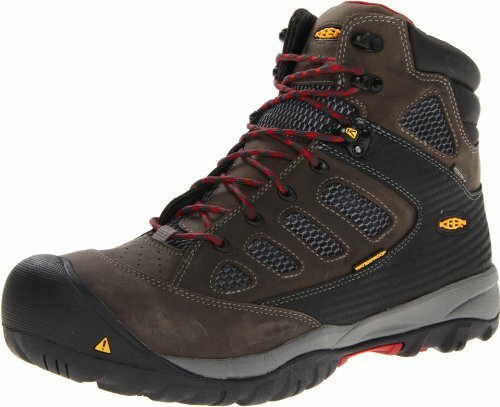 Keen makes it on our list again with their Men’s Tucson Mid Work Boot from their Utility line. As a durable shoe/boot, they provide added comfort with a removable metatomical dual density EVA footbed, a lining equipped with hydrophobic/hydrophilic 2-zone comfort technology and a breathable, waterproof membrane that will keep the interior of the boot dry and detour odors. The boots themselves are constructed out of waterproof Nubuck leather, plus, the thermoplastic polyurethane shank for the midfoot provides support. Steel toes that are ASTM rated are integrated into these boots and the outsole is non-marking as well as slip and oil resistant, which is highly important if working as an auto mechanic or salesman walking or standing on cement or tile floors. Easily adjust the fit of these boots with the simplistic lace-up feature with locking metal hooks, which prevent the boot laces from loosening. Sometimes you need a boot that will serve you efficiently in colder weather as well as accommodating cement surfaces. This Diagnostic Hi Cut Cap Soft Toe Waterproof boot combines insulation with comfort by integrating 200 grams of insulation for warmth during those chilly days. In addition, they are also waterproof which will allow you to work outside when the weather is wet. The full-grain leather construction comes equipped with a rubber sole and a rubber toe cap. Although they aren’t considered a safety toe boot, the rubber does help prevent wear and tear, and the sole has sufficient traction to keep you steady on your feet. All of the boots featured in this line offer a breathable mesh lining, steel shanks for support, and non-slip outsoles to prevent slipping on wet surfaces. 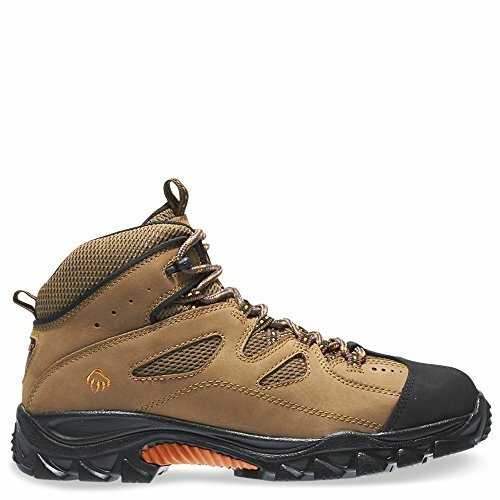 As a boot that is meant to tackle hard ground, while providing comfort to your feet, legs, and back, it’s also a nice choice for someone working outdoors on the concrete and who is subjected to the elements of nature. 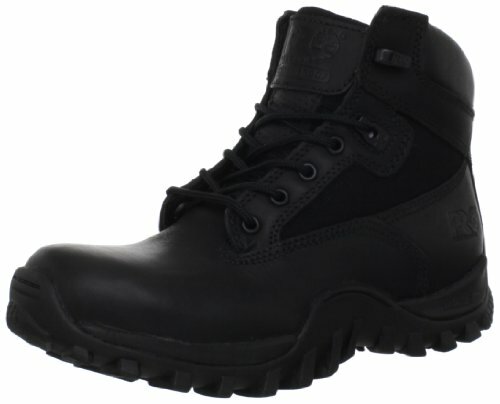 Timberland has a sufficient line of boots that basically can conquer any type of element, in addition to our other featured boots designed for walking on concrete, this Pro Valor series is also a nice choice depending on what you’re looking for in features. This lightweight boot is designed with Timberlands anti-fatigue technology system to absorb shock and return the energy back to the foot. For added comfort, a breathable mesh lining with an anti-microbial treatment detours moisture and prevents odor. A Vibram outsole that is slip and oil resistant combined with a lightweight midsole allow for continuous support and comfort. Cement construction provides flexibility and easy break-in time. In addition, these full-grain leather boots are waterproof and abrasion resistant. As one of the choices in the top brand boots and shoes for concrete, they could be ideal for factory workers, warehouse workers, or road service workers. Also, our most comfortable work boot section offers some valuable information. Sometimes you spend your days on a hard surface such as concrete but don’t need the additional protection of a work boot. Here are some of the best shoes to protect your feet. Propet Men’s Wash and Wear Pro Walking Shoe is a machine washable shoe, constructed out of leather and neoprene upper with dual pull loops for easy on and off assistance. In addition, they are incorporated with a removable cushioned insole and can accommodate orthotics which is an added benefit for those needing additional support and comfort. Cushioning is provided by an EVA midsole, and a breathable Nylex lining, keeps the air flowing to eliminate sweat and odor. The high-traction rubber outsole grips surface to assist in walking pleasure, instead of worrying about slippage. As one of the most comfortable walking shoes, the company has paid additional attention to areas of your feet that require extra support, while conforming to your feet in such a way to provide easy movement to the parts of your foot that need it most. Furthermore, the lightweight, comfortable design will assist with long wear on cement and hard surfaces. These particular shoes would suit someone well if they work in a warehouse or store where surfaces are hard and unrelenting. 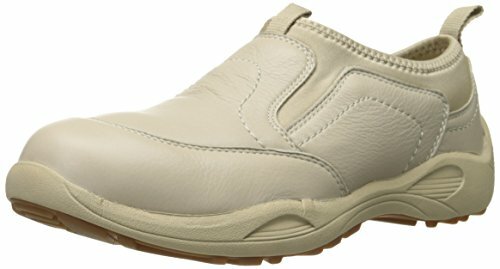 The World Tour Classic Walking Shoe manufactured by Rockport, is a versatile shoe that can be casually worn every day or as a work-appropriate shoe for the office. They are designed with a forefoot flexibility and special walking platform construction. A specifically designed Eva midsole with built-in Strobel Technology construction which is a thin sock liner that incorporates stability and flexibility, plus, a synthetic rubber outsole provides ample shock absorption to reduce strain on feet and legs. Plus, added traction ensures ample gripping on various surfaces. Furthermore, the full grain leather upper naturally conforms to your foot overwear to provide a personalized fit and the padded tongue and collar reduces rubbing and prevents blisters. In addition, these particular shoes are easily cleaned and maintained to extend the life of the shoe. Whether you’re walking on cement or strolling down sidewalks, Rockport Men’s World Tour Classic Walking Shoe is built for comfort and flexibility on these hard surfaces. The Keen Austin Sneaker features water-resistant leather and a textile lining that detours moisture and provides a dry, comfortable fit all day. 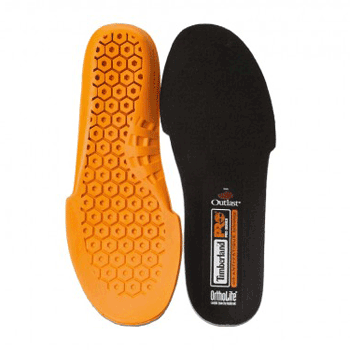 A rubber outsole with traction is equipped with patented toe protection that wraps completely around the toe portion of the shoe, which is perfect for those unexpected instances when your toes might come in contact with a hard object. A Keen Metatomical footbed conforms to your foot naturally and provides adequate arch support plus comfort when walking on hard surfaces such as concrete and pavement. This particular style is great for people with flat feet or has other issues such as back problems. In addition, these casual lace-up walking shoes fit true to size. These shoes are designed for those who are continually on their feet or standing on hard un-giving surfaces. These Timberland Pro work shoes are equipped with Comfort System, Polyurethane midsole with a High-Rebound heel insert plus molded heel cup that cradles the heel providing that needed comfort and cushioning on concrete surfaces. Plus, the Energy Return Nylon Diffusion Shank returns energy to the feet and provides adequate torsional rigidity plus, supports the arch of the foot where needed. Temperature is regulated in the shoe from an anti-microbial contoured Outlast Adaptive Comfort footbed. In addition, the outsole is slip, oil and abrasion resistant provides stability on slick surfaces such as wet concrete flooring. These full-grain oiled leather work shoes are designed for durability, long wear, and provide adequate protection to those who work in areas with cement and concrete floors such as factories and warehouses, or even fast-paced work environments where you’re always on the move. However, something to consider if purchasing these shoes is they are not waterproof and will require a water resistant application if you’ll be subjected to water. 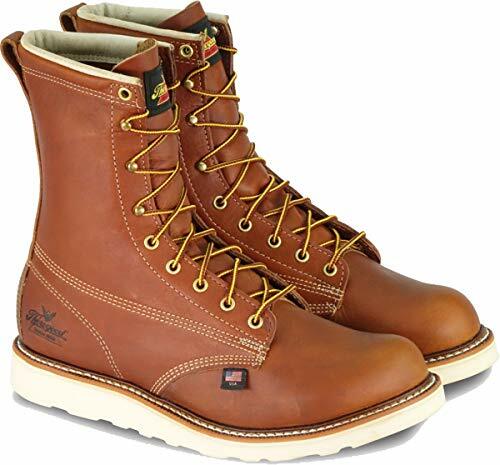 Thorogood offers some of the top work boots available, and they also contribute to styles that accommodate walking on concrete comfortably all day, unlike some of the generic brands that claim the same. 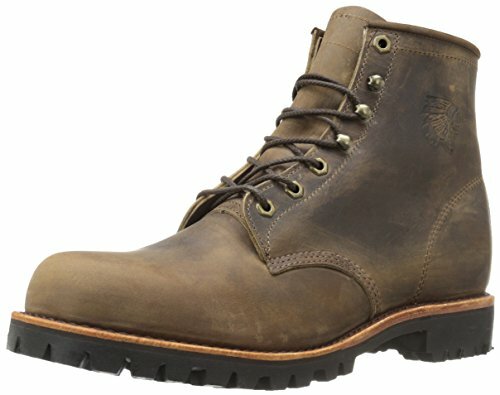 The Men’s American Heritage 8” Plain Toe Boot is constructed out of oil-tanned leather accompanied by an engineered composite shank for support and standard Cotton Drill Vamp Lining that pulls moisture away from the foot. In addition, the insole is fabricated with a Removable Dual Density Ultimate Shock Absorption Footbed on a Poron 4000 Comfort Cushion. The outsole is designed with a Thorogood MAXwear wedge that is slip resistant and combined with a rubber midsole. These particular boots are not equipped with a safety-toe and would not be suggested for use in heavy construction areas or logging, they would, however, be efficient for those who are on their feet for long periods of time in less hazardous working zones. Click to read more Thorogood boots reviews. Extra Cushioning – Shoes or boots should have additional cushioning to absorb the shock and impact of your feet constantly coming in contact with the hard concrete. Oftentimes, the labeling will specify if it offers a shock absorbing footbed or sole. 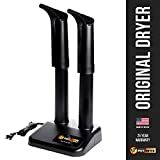 Removable footbeds and lining are convenient, as it manipulates the cushioning inside as well as allowing you to clean them or let them air out. Slip Resistance – We all are aware that concrete floors are rather slippery when introduced to water, so it’s imperative that your shoes/boots offer that protection to grip the surfaces to prevent falls or injuries. Flexibility – A lot of boots or shoes that are designed for walking on concrete offer a more flexible design to accommodate the motion of your feet. Support – The more support you have for your feet the better. Concrete and other hard surfaces are flat, and your feet take a beating when subjected to un-giving surfaces, so it’s important that your shoe or boots offer adequate support in certain areas of your foot such as the midsole, arch, and heel. Concrete floors are extremely harsh on your body and walking or standing on them for long periods of time can create health issues such as swollen feet and ankles, varicose veins, and severe back pain. Though sometimes conditions at work are unavoidable, and the only surfaces provided are concrete floors. However, there are a few tips we can give to assist you in preventing these issues contributed from cement flooring. Change Positions – Don’t stand in one place for too long, alter your stance often. Switch your weight to alternate legs every few minutes. Resting Spots – If at all possible have a chair or stool present that enable you to take the weight off of your feet for brief periods of time. If that isn’t possible, rest your foot on a foot bar, or lean on a countertop to alleviate pressure from your feet and back. Appropriate Footwear – Wearing appropriate footwear can make all the difference when walking on concrete floors. Appropriate heels and cushion provide the shock absorbing insulation between your feet and the concrete so your body doesn’t take all the pressure. In addition to having the right shoe or boot for cement, it is recommended that you also have an extra pair in order to rotate their wear. Orthopedic Inserts – If you’re especially sensitive to hard surfaces, or you are already plagued with a back or foot conditions, you might want to consider purchasing orthopedic inserts for your shoes or boots. They will provide additional padding and/or arch support for your feet. Anti-Fatigue Mats – Though not always present in a certain working environment, if it’s possible having a few well-placed anti-fatigue mats will give your feet and body a rest from continually subjecting yourself to concrete floors. They provide a resting place for your feet, take advantage of them. Back pain caused by walking on concrete can be debilitating, and it makes your job virtually impossible especially when you’re constantly stopping to readjust or stretch. Plus, continuing your job when your back is already in pain, could make it worse. Pain is a warning sign, and it alerts you to something that’s not quite right with your body. It’s important to heed these warnings and do something about it before it becomes a condition that is irreversible. If you are experiencing back pain from walking on the concrete daily, you should consider some possible remedies that will assist in alleviating your discomfort. As mentioned in a previous section, shoes and boots that are specifically designed for these occasions are a necessity. A well-cushioned insole and adequate support for your feet will take off a considerable amount of fatigue you’re experiencing. Another option is to take a minute out of each hour to stretch, this can be done while you’re working and doesn’t require much effort. Basically, stretching is lifting your arms over your head, semi-rotating your body, flexing your back muscles, and grasping your knees and pulling them up to your chest. This prevents your body from becoming stagnant and stiff. However, if you experience pain while stretching, cease that particular action; existing injuries to your back could become worse with certain movements. Pay attention to the way you are standing or walking, make sure you stand up straight and keep your shoulders and head aligned with your hips. This practice will ensure that your spine remains straight instead of curved from a slouched position. Back pain can be a serious issue, and it’s suggested that you seek medical attention from your doctor if pain persists for long periods of time. In the meantime, by following certain rules to prevent back pain can assist in avoiding it all together. Feet are important, in order for them to last you the remainder of your life and serve you well, you also need to serve them well by wearing the appropriate boots or shoes for the occasion. Having the best working boots for standing on concrete is imperative and in order to properly inform you on the specific top brands that offer these particular types of boots, we had to dig in and investigate. We at BootRatings, hand select the best in the market backed by positive reviews, and then we break it down further to give you adequate and reliable information to assist you in making a purchase. Don’t settle for less, be informed and get the best available for your money.